While reading the commentary, please bear in mind that it refers to the Alaska Highway in 1978, NOT today! 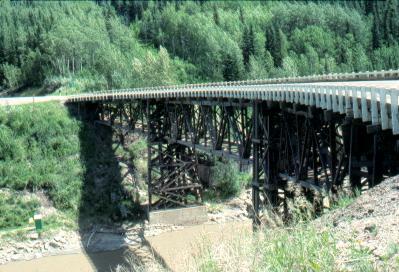 The Alaska Highway starts at Dawson Creek in mid-northern British Columbia (in Canada). This is known as "Mile 0". The first 90 or so miles are paved, then there's about 1000 miles of gravel road, all the way to the Alaska border, with just a few paved sections in between. 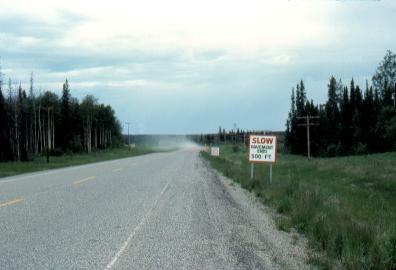 The entire Alaska highway is now paved (2003). Although this means that it's a lot safer to drive, and one can get up to Yukon and Alaska a lot faster, most of the adventure is gone. It used to be a definite journey into a remote area of the country, along a sometimes difficult road, to reach those northern areas. Most of that sense of adventure is now lost. This is the Kiskatinaw River. Bridge over the Kiskatinaw River. This bridge is made of wood, and it visibly bounced as transport trucks drove over it! 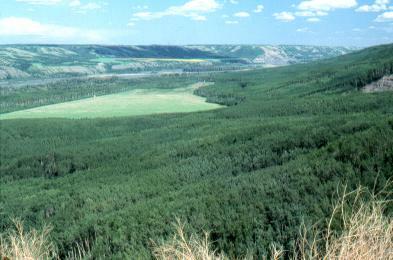 The Peace River is one of the larger rivers of Canada. 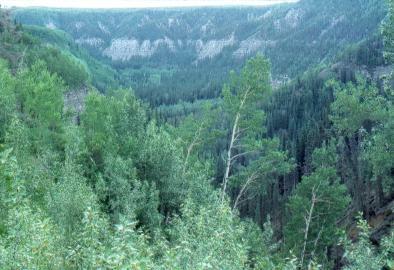 It is the only river in North America to penetrate eastward across the barrier of the Rocky Mountains. It is often known as the "Mighty Peace". There is farming and ranching in this area, as well as a lot of oil and gas exploitation. 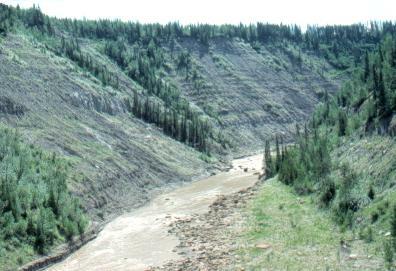 The Alaska Highway goes downhill for 4 miles to reach the river itself. Here the valley is 1000 feet deep! The end of the pavement going north! Coming south, motorcyclists have been known to stop and reverentially kiss the pavement, the end of the gravel road that they've been traveling on for days. From here, The Alaska Hwy is a gravel road for most of the next 1130 miles (1830 km)! There are only one or two paved sections in between. In Alaska it becomes paved again (from Mile 1222 onwards). 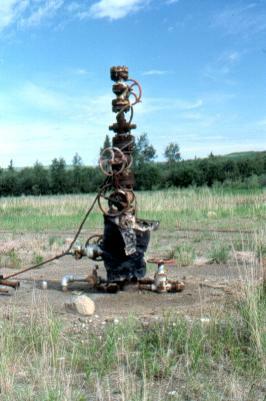 This is an old abandoned gas well head, called a "Christmas Tree" by those in the business.